Maintaining the body in a functional state over a typical human lifespan of 70 to 80 years would not be possible without continuous replenishment of cell populations through stem cells. The half-life of our erythrocytes, for instance, is only 120 days! Our regenerative capacity is however limited, especially in the case of injury and disease. A stroke often has debilitating consequences due to irreversible loss of neurons in the brain, and prosthetics is the only option for those losing a limb in an accident or in combat. There is, however, one group of animals that does extremely well in terms of regeneration: among vertebrates salamanders are the champions of tissue repair and replacement and the axolotl is the preferred model organism. This amazing animal is able to perfectly regenerate an entire limb following amputation and to replace portions of the brain or the heart after injury. It would therefore be potentially very rewarding to understand in detail how this creature masters such a high level of regenerative competence. 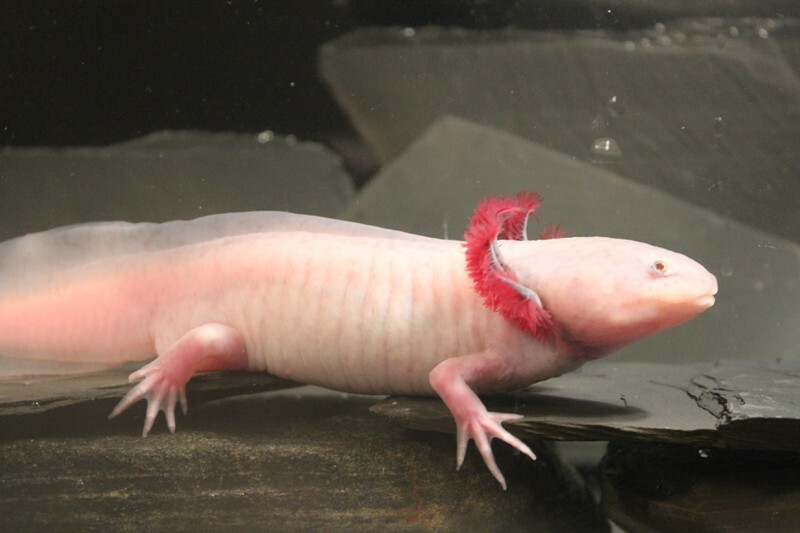 In her essay Jessica Whited provides a fascinating insight into the cellular and molecular mechanisms of axolotl limb regeneration. Capturing small critters, examining them, releasing them back to the wild—memories of these childhood joys occupy many a scientist’s headspace, but they’re also how people often first become aware of regeneration in the natural world. Before the biology textbooks, there are the lopsided crayfish and the stumpy-tailed salamanders. Humans are innately curious about how an animal cruising around one minute might lose an entire piece of its body and not only survive, but live to grow it back. Perhaps this seems unfathomable to us because we are so very outdone in this realm by other species. The urge to understand the mechanics of this fascinating biological problem is strong. In the recent decades, this ancient urge has finally been matched with a new generation of scientific tools which is enabling an unprecedented look under the hood one of nature’s most wonderful mysteries: salamander limb regeneration. Among salamanders, the axolotl (Ambystoma mexicanum) has emerged as the premiere model species for understanding limb regeneration. 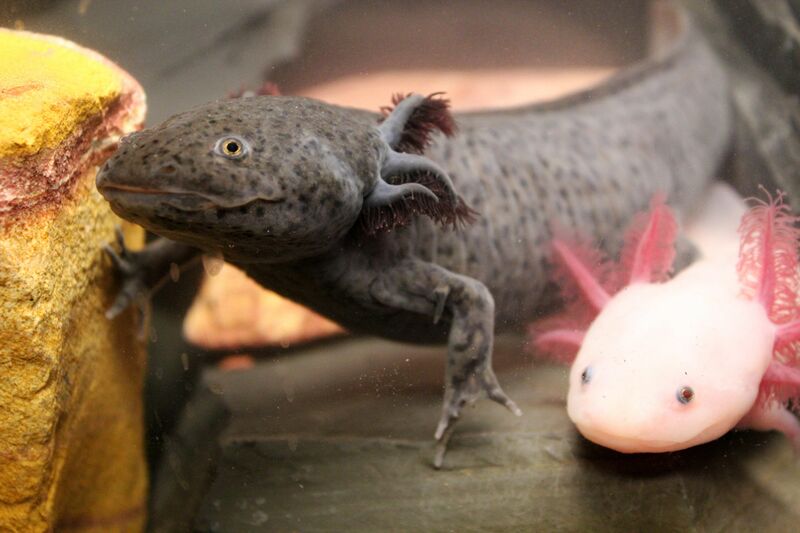 Axolotls once thrived in brackish lakes outside of Mexico City, but they are now critically endangered in the wild. A laboratory breeding stock was established in the 1800s, and descendants of these founding animals fuel scientific research in a number of labs across the globe today. Axolotls have a relatively fast life cycle for a salamander, reaching sexual maturity around nine months of age. As neotenous　animals, their life cycle differs from that of a protoypical salamander: axolotls do not undergo a final metamorphic stage and take to land. Instead, they are permanently aquatic, equipped with beautiful feather-like gills surrounding the face to capture oxygen. Their adult bodies are reminiscent of giant-sized larval stages of fully-metamorphic salamanders. Curiously, axolotls can be induced to undergo a final metamorphosis and rendered terrestrial by administration of the hormone thyroxine. 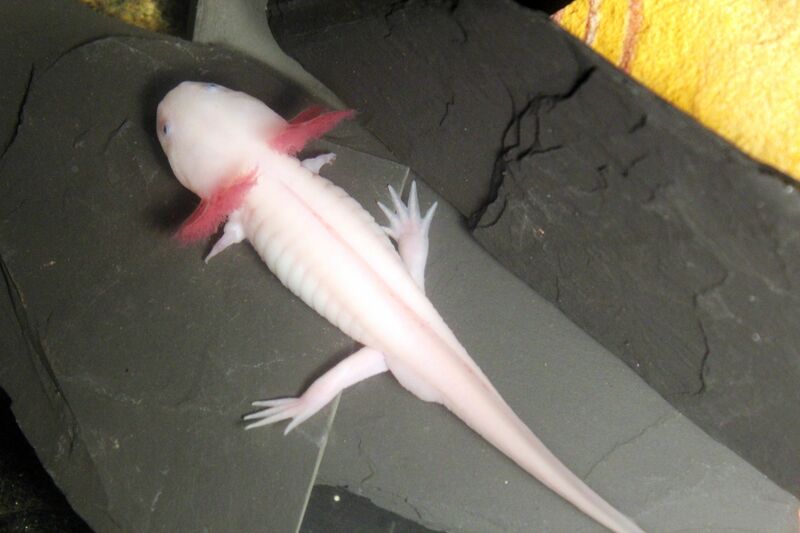 However, axolotls forced into a terrestrial form maintain the ability to regenerate limbs, as do many fully-metamorphic salamanders, so neoteny is not a requirement for successful limb regeneration in these creatures. Axolotls are relatively simple to breed in the lab and produce hundreds of progeny with each mating. Eggs are large and can now be manipulated genetically, permitting the interrogation of specific genes in regenerative processes. Beyond the limb, axolotls have extensive regenerative abilities, and they can regenerate their tails (including the spinal cord inside), large portions of their hearts and other internal organs, and some brain structures. Many of these regenerative tendencies are shared with other salamanders such as the intensively-studied newts; however, the extent and type of tissue regeneration across all salamander species remains poorly investigated. Shown is an adult axolotl photographed from a side view. Note the robust right forelimb (four fingers) and hindlimb (five toes). The feather-like red plumes around the head are the gills. This animal is a pigmentation mutant, called the white mutant. White mutants are commonly used for laboratory work because their tissues are more translucent than the native, wild-type animals, which are a mottled brownish-black (see image below) (Image credit: Jessica L. Whited, Harvard Medical School). A wild-type axolotl (the brownish-black one) as it would appear in its native habitat next to a white mutant. The wild-type pigmentation makes sense for camouflage in the wild as axolotls live at the bottom of a lake (Image credit: Jessica L. Whited, Harvard Medical School). The salamander limb has essentially all the same parts as the human limb and includes muscle, bone, cartilage, tendon, joints, nerves, blood vessels, and connective tissues. The outside is covered in skin; though incompletely characterized, salamander skin shares some properties with human skin. Some aspects are different, and these differences may impinge upon the animals’ abilities to regenerate. Much is known about how mammals pattern their limbs during development, and so far, many of the key molecular pathways to acquire proper limb pattern are shared with salamanders (discussed later). Therefore, focusing research on other aspects of limb regeneration seems likely to produce the most novel insights into the overall question of why many salamanders can regenerate limbs and mammals cannot. How do salamanders do it? The hardest part might be creating the group of cells, called the blastema, which will form the new limb; once the animal makes a blastema, it’s possible the rest will follow. Blastema formation is especially important to understand because using a blastema to effect regeneration is a common feature among master regenerators, but in nearly all cases, mammals do not respond to amputation by creating blastemas. Blastemas are chock-full of activated progenitor cells, proliferating, and poised to generate the requisite tissues for the new limb. How do they get there? What happens after an amputation to signal these special cells to awaken, to migrate to the tip of the limb, and to organize themselves? Considering this structure in modern terms, the blastema plus its overlying specialized skin would probably be called a niche. Niches are places in the body where stem cells interact with support cells and the environment to either keep them in a reserve state, to alert them, or to activate them to divide. These activities are happening everyday in the human body during normal tissue homeostasis, for example, in the gut and the skin. They are also activated following injury. In a salamander, once the limb is amputated, the animal must somehow generate this niche-like blastema structure on command. Seconds earlier, the limb was being used to crawl or swim, and the tissues inside were largely composed of mature cells. Yet somehow the amputation leads to the activation of many types of blastema progenitor cells, and somehow these progenitors self-assemble into a little nubbin with great potential. The right forelimb was amputated approximately six weeks before the photo was taken. This amputation occurred midway through the upper arm. Following the initial blastema outgrowth, the limb has begun to take its characteristic shape, and four digits can clearly be distinguished along with a network of still-developing, yet functional, blood vessels. Close inspection reveals the interface between the stump, with its more opaque skin, and the newly-regenerating portion, with its translucent skin. At this stage, the stump is also considerably thicker than the regenerating portion, but with time, the regenerating portion will grow to precisely match the stump in girth (Image credit: Jessica L. Whited, Harvard Medical School). Both forelimbs were amputated at the mid-humerus level approximately six weeks before the photo was taken. Note the interface between the thicker and more robust stump and the regenerating portion of both limbs. The hindlimbs were not amputated on this animal, and thus their size can be used as an approximate reference point for the size of the forelimbs pre-amputation and the amount of tissue that stands to be regenerated (Image credit: Jessica L. Whited, Harvard Medical School). The kinds of progenitors that are called to become activated and join the blastema are still under intense investigation. Early studies noted an apparent dissolution of cellular architecture near the amputation site, leading to the speculation that many, if not all, progenitor cells in this process are formed by dedifferentiation. Mature cells functioning during homeostasis　, such as muscle cells which expand and contract to drive movement, are said to be differentiated. Differentiated cells can be easily cartooned with a characteristic architecture, and in many cases there is deep scientific understanding of the underlying molecular genetic programs that drive their differentiation from immature cell types. In contrast, a dedifferentiated cell is a cell that was once fully differentiated and performing a specific kind of task, and its cellular parts were likely arranged in a very stereotypical way for that type of cell. Once cued to dedifferentiate, a cell likely undergoes dramatic changes in gene expression and cellular architecture. These changes can be thought to be bringing the cell back in time, toward a more immature state. Immature states may be more labile, and allow cells to either acquire distinct fates from their original character or they may simply allow for the reprogramming that might be necessary during the process of regeneration. While dedifferentiation as an instrument of blastema creation and limb regeneration is still a concept that appears to hold true for some cell types, the story is likely more complicated. Previously unappreciated, and sometimes numerically rare, cell types may be acting as reserve cells—stem cells—essential for regeneration, called into action when the need arises. At this point, the possibility that much of the tissue mass to be regenerated is derived from activated stem cells cannot be ruled out. Older studies relied on physically dissecting tissues, transplanting them, and performing static histological analyses. These approaches are inadequate for drawing robust conclusions about the origins of cells required to grow a new limb from a stump. Precision tools capable of labeling discrete cell types and following their behaviors, within the milieu of numerous other cell types, will absolutely be required to definitively answer these questions. Regardless of what mode is used for what cell type, both dedifferentiation and stem cell activation require external cues, and activated progenitor cells must collect into the blastema. The source of these cues has been intensively studied, and recent advances in salamander genomics are allowing for more precise identification of specific signaling molecules. A key role for the specialized skin, called the wound epidermis, in the process of blastema formation, has been known for many decades. After amputation, one of the earliest cellular events to occur is the migration of stump epidermal cells across the cut tissue. These initial wound epidermis cells proliferate, and the wound epidermis thickens. Wound epidermis is physically different from ordinary epidermis. One feature likely to be important for regeneration is that it lacks a thick mat of collagen beneath the basal cells. Collagen fibers are used throughout the body for structural support, though they can also be involved in molecular signaling events. As part of the extracellular matrix, they undoubtedly help control the movement of molecules across space. Without a collagen “fence,” molecules secreted by the wound epidermis might have free, unfettered access to the internal tissues of the limb and, ultimately, to the blastema cells once they have gathered in the adjacent space. Communication from blastema cells to wound epidermis cells might also be enabled by the lack of a physical barrier between the two. Structurally, the wound epidermis exists in a perfect place at a perfect time to influence events that occur on the stump and within the blastema. Experimentally, the importance of the wound epidermis has been confirmed. Continued removal of wound epidermis (because removing it once leads to its regrowth) impairs the growth of the blastema. If the wound epidermis formation is completely blocked, for example, by drawing a swath of normal epidermis across the cut end of the amputated stump and suturing it in place, no blastema forms. Intriguingly, human children can regenerate a tiny portion of their fingertips, but only if skin is not sutured across following the injury , thus highlighting a possible conserved role for specialized skin. Blastema formation has now been documented to be dependent on another cell type: macrophages　. Animals whose macrophages have been systemically depleted by a macrophage-specific poisoning strategy cannot regenerate limbs . This recent discovery is particularly exciting because it speaks directly to a long-standing broad hypothesis that regenerative tendencies might be controlled by the immune system. Much work remains to be performed to fully understand how macrophages influence the cellular events post-amputation and facilitate limb regeneration. Because macrophage-deficient animals do not grow an obvious blastema and this cell population can be responsible for clearing dead cells in other contexts, one possibility is that without cleaning up the cellular debris near the amputation site, blastema cells cannot physically move to their required positions. Another possibility, though not mutually exclusive, is that macrophages produce pro-regeneration signals that are required for regeneration. Once a nascent blastema forms, it must be nurtured to survive and grow. A limb post-amputation is very likely a hostile cellular environment, subject to stresses that might not prevail during homeostasis. Therefore, blastema cells may employ specialized mechanisms for escaping the urge to commit cellular suicide and undergo cell death. An intriguing study recently confirmed that activated muscle progenitor cells in the stump do engage in the first steps of a programmed cell death pathway, but they ultimately abort this route, and instead go on to contribute to the regenerate limb . Blocking the cell death initiation process entirely impairs regeneration, so it is a necessary component of the process. Forty years ago, the observation was made that early blastemas are relatively avascular in both newts and axolotls . This finding raises the possibility that mechanisms for preventing precocious revascularization might exist, and that early blastema cells might thrive in a vessel-sparse environment. Future research should investigate this relationship more thoroughly using method for tracking vessels and the cells and metabolites they conduct that were previously unavailable. The entire vascular system of the axolotl was filled with a fluorescent dye. This dye intercalates into the cell membranes of the vascular endothelial cells, allowing for the direct visualization of the structure of blood vessels (Image credit: Jessica L. Whited, Harvard Medical School). Under ordinary conditions, nascent blastemas can only grow larger and mature if they are properly innervated. This dependence was first observed in 1823 , but the relationship between nerves and blastema cells is still incompletely understood. Successful regeneration requires a threshold of nerves, though this requirement can be met by either motor nerves, sensory nerves, or some combination of the two. The “firing” of nerves is not what is required; rather, some factor(s) from the nerve cells are likely to stimulate cell proliferation in the blastema cell pool. 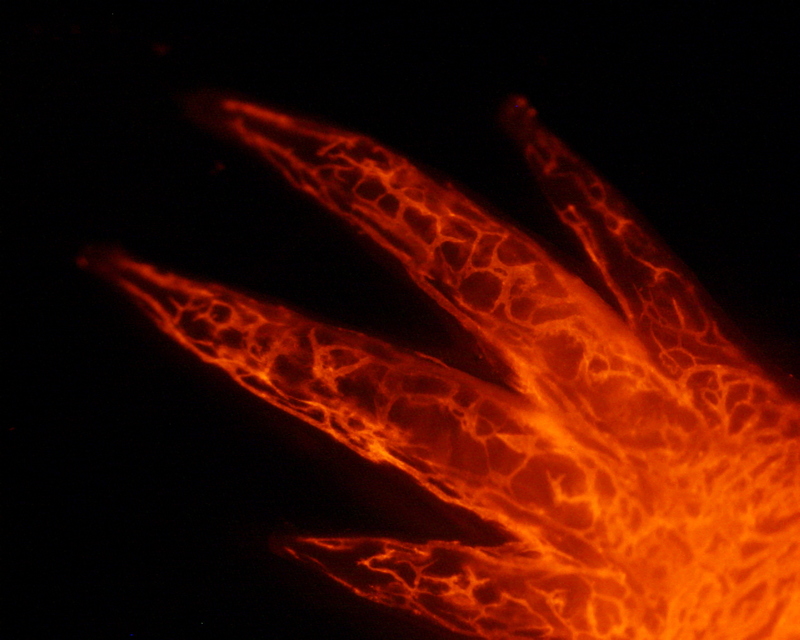 In the last decade, several molecules have been discovered to be capable of rescuing denervated limbs, thus allowing them to regenerate entirely or at least to grow their blastemas more rapidly. The first was a secreted molecule, Anterior Gradient protein, recovered in a screen for the binding partner of a receptor that is differentially expressed along the proximo-distal axis of the limb　, Prod1. In denervated newt limbs, this factor alone is sufficient to allow about 50% of limbs to regenerate to the stage of growing digits . Recently, Neuregulin, another secreted molecule, was shown to produce a similar effect insofar as it could support the growth of blastemas in denervated limbs better than if it’s not supplied. Importantly, inhibiting endogenous Neuregulin function with a chemical inhibitor blocks regeneration, suggesting this protein is required for proper regeneration . Important tissue-tissue interactions between nerves and other cell types besides the blastema cells per se are likely to emerge as the secrets of limb regeneration are laid bare on a molecular and cellular level. For example, how do nerves interact with the wound epidermis? Is there a connection between nerves and the immune system? After a blastema has formed and achieved the appropriate size, cellular differentiation commences and the relatively immature blastema cells begin to go down their separate paths to form specific tissues. This process may be largely similar to the differentiation processes that govern how a limb first develops from a limb bud　. Limb development in most tetrapods happens during embryogenesis, while most of the animal’s tissues are immature. In salamanders, however, it usually happens after the tiny juvenile salamander has “hatched” from its jelly coat and is a free-living, swimming, feeding larva. This difference may be important and may be linked to the ability to regenerate limbs, especially since creating a limb bud from a robustly muscularized body wall which is also ensheathed in a fully mature epidermis could be quite different from creating a limb bud in an embryo. Nonetheless, once the buds exist, there is some evidence their development is similar. Several experiments have demonstrated that key aspects of differentiation and patterning of cells coming out of blastemas are shared with cells coming out of limb buds. For example, the anterior-posterior axis of the limb　is critically dependent on the secreted signaling molecule Sonic hedgehog, which is made by posterior bud cells. Eliminating this molecule during development results in loss of the anterior digits, and expression of Sonic hedgehog in the anterior region results in growth of extra digits. 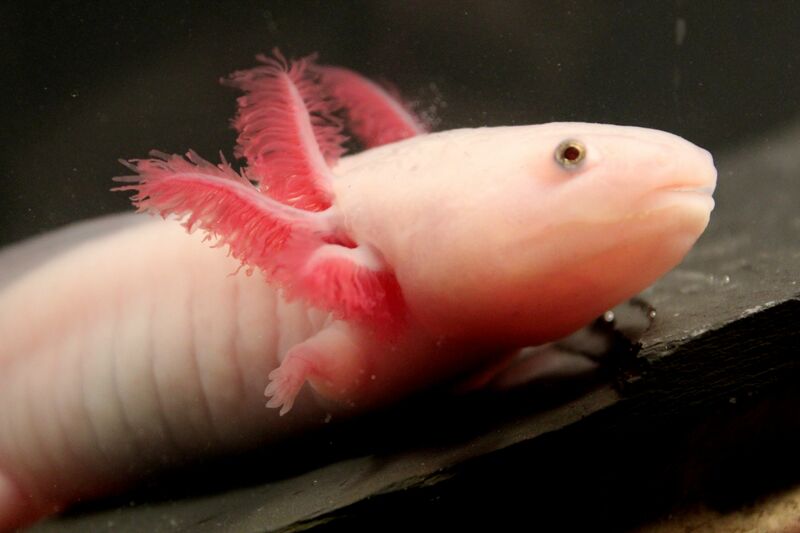 The exact same relationship has been demonstrated in regenerating axolotl limbs . While more work is necessary, largely parallel patterning mechanisms may be operational between development and regeneration. A hairier question, though, is whether a substantial amount of transdifferentiation occurs between lineages going into the blastema and emerging from it over the course of regeneration. For instance, are all cartilage cells in the original limb destined to be cartilage cells in the regenerated limb? Several transplantation studies in which donor and host cells can be distinguished from one another and permanently tracked have addressed this question. Most recently, transplantation work found very little transdifferentiation occurs during normal regeneration . Much work remains to be done on this large question of cellular lineage across regeneration, and this work will surely be enabled by the precision tools for lineage tracing. Before leaving this question about what happens after blastema formation behind, there are two very salient features of limb regeneration as it relates to patterning that need to be understood in order to contemplate full, perfect regeneration in a human being. The first is that a salamander limb “knows” exactly how much to regrow following loss of a part of a limb. If only the foot has been removed, the animal will regenerate only a foot, and never an entire limb. Amputations closer to the body will regenerate more material and structures, because no matter where the amputation occurs, what is missing is exactly what is replaced. From transplantation studies, a blastema’s autonomy has been established. Blastemas from proximal amputations are coded to form an entire limb, and those from distal amputations are coded to form just the distal part of the extremity. How exactly this information is encoded will need to be fully understood. Currently, the thinking is that highly-regenerative animals maintain positional determinants within their intact tissues, and this information is imparted upon the blastema when the time comes to regenerate part of the limb. Non-regenerators might also harbor this positional information after development—there are some clues they do—but they might also be compromised in some way in this respect. In any case, it is not a given that if scientists could induce blastema formation in human patients post-amputation, that those blastemas would grow the correct amount of limb to replace only what has been lost. Therefore, figuring out how salamanders solve this problem will be essential to productively applying any of the limb regeneration principles to the human condition. Left: A fore-limb was removed from the axolotl and subjected to a staining protocol that renders cartilage blue and ossified bone reddish-purple. Note that the skeletal pattern is similar to the human arm. Additionally, like human long bones, axolotl long bones form via a process called “endochondral ossification” whereby first a cartilage scaffold is laid down. This cartilage is later replaced by bone starting from the center of the element and working towards the two ends. As this animal was fairly mature, its long bones exhibit extensive ossification. Right: A newly-regenerated fore-limb was subjected to the same cartilage/bone staining procedure as the original limb depicted on the left-hand side. This sample was stained after the limb had completely regenerated its size and overall structure. However, because the skeleton is initially entirely cartilage, the elements appear only as solely blue. At the very right-most margin, the older, stump skeleton is visible, and a tiny bit of purple hints at is ossified nature (arrow) (Image credit: Jessica L. Whited, Harvard Medical School). The second essential feature about patterning that needs to be wrangled if limbs are to regenerate perfectly is proportion. When animals first grow a limb, it is usually much smaller than it will be when the animal is fully mature (think about how tiny a baby’s arm is compared to a grown person). One exception is in animals that molt to grow larger, such as many insects. Largely, though, continued growth of the animal is a common feature. Now consider that a limb might be lost at any stage of the animal’s maturation—when it is tiny, or when it is large. If a large animal were to regenerate a limb but only in a tiny form, that limb would be of limited utility to the organism. Conversely, if a tiny animal regenerates a limb, but it is inordinately large for its body, this outcome would not be helpful. Nature has hacked this conundrum, and salamanders that regenerate limbs replace the lost limb with a new one of the exact correct size for that animal’s body. It is a mirror image of the uninjured limb on the other side of the body. How this happens is largely a mystery. Some recent clues to explore have come from fish fins, where changing the expression of potassium channels, which regulate the movement of potassium ions across cell membranes, can alter the size of the regenerate fin . The relative concentration of ions across cell membranes (“membrane potential”) can likely influence many cellular processes, and elucidating the details of how bioelectricity might control fundamental aspects of limb regeneration is imperative. People often ask if humans might be able to regenerate limbs in the future. A logical response seems to be that if we don’t understand exactly how salamanders can do this naturally, we are in a much weaker position to even formulate therapeutic approaches for humans. If one accepts this premise, then devoting more research effort toward a thorough understanding of salamander limb regeneration is a worthy enterprise that may one day help the human body while satisfying the human curiosity. 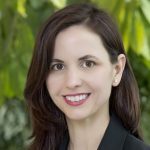 Jessica L. Whited is Assistant Professor at Harvard Medical School. She is one of few scientists worldwide who work with the axolotl as a model organism for studying mechanisms of regeneration.